Referred to as "Another Walt (Disney)" by Walt's brother Roy, Howard Ashman is more regularly dubbed one of Disney's Heroes of the 20th Century. A phenomenal American playwright and lyricist Ashman first studied at Boston University and Indiana University. His work partner in crime at Disney, Alan Menken composed the music while Howard wrote the lyrics. Plagued by tragedy for a number of years and trying to find his way in a world that didn't altogether open its arms to gay men, Ashman died of AIDS/HIV in 1991 aged 40. Between 1969 and 1983 Howard lost two boyfriends to the disease. Attempting to deal with his grief, he wanted to leave New York and it was then that Disney fortuitously called him up and he began visiting LA for a number of weeks and started putting his new 'Disney money' into building his dream home with new partner Bill. In March 1987 he found 'white patches' on his mouth, went to the hospital and was diagnosed with HIV. He refused to publicise the disease to his colleagues and pushed on with his hectic work schedule of both 'Aladdin' and 'Beauty and the Beast' but after 'The Little Mermaid's success and release, his health deteriorated. From his deathbed, he wrote the lyrics for the songs from Beauty and the Beast. On March 10, 1991, after the Disney animators had their first screening for Beauty and the Beast (which was an huge success) they visited Howard in the hospital where, his mother showed them that he was wearing a Beauty and the Beast sweatshirt in support. He died 4 days later. The film Beauty and the Beast is dedicated to him: "To our friend Howard, who gave a mermaid her voice and a beast his soul, we will be forever grateful. 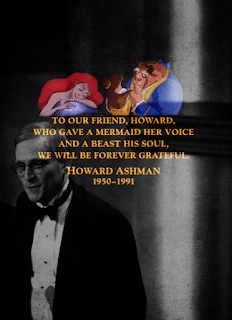 Howard Ashman 1950–1991." Another random fact: he is the lyricist of "Codinome Beija-Flor" and "O Tempo Não Para", two of the biggest hits of the Brazilian rock singer Cazuza, who also died of AIDS, 9 months before Howard in 1990.